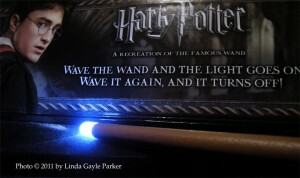 Adults and young Harry Potter fans alike will love Harry Potter’s Wand with Illuminating Tip from the Noble Collection. It is a fun must-have, either as a toy and or as a collectible. This 14″ resin re-creation of Harry’s famous magic wand requires only a simple tap or a “swish and flick” of the wrist (as recommended by Professor Flitwick in Hogwarts’ Charms classes) to make the wand tip light up with a brilliant white glow. The intensity of the LED light can be adjusted from dim to high brilliance by holding down a button on the wand’s handle. At its brightest setting, the wand looks awesome and eerie in the dark, and it is popularly used by kids as a flashlight, although, I certainly have fun walking down my own hallway with it after dark. A small key is included with the wand, allowing easy access to the battery compartment at end of the handle. 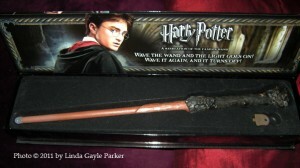 The wand comes in a sturdy and colorful box, with velveteen interior. The box is decorated inside and out with images of Harry and graphics from the movies. It is suitable for display or storage. My own box states that this collectible is for ages 10 and up, but I have also seen it listed on various websites for ages 6 and up. There are a few downsides to this illuminating wand. The LED light in the wand tip is very sensitive to taps. Putting it in its box and closing the lid is enough to make it light up; so is bumping the box or moving it. Luckily, the lid does not close tightly, so you can see when the LED light comes on. Just give the box another tap to turn it off. Some fans are a bit disappointed that this resin wand does not look more realistic to wood, but the size, shape and detail are basically true to Harry’s wand in the movies. The key that gives you access to the battery compartment is small and could be easily lost, so it is best kept secure in the box. There are versions of Ron and Hermione’s wands available with illuminating tips, as well. None of the Harry Potter movie collectible wands are cheap. However, these illuminating wands are such a unique and fun collectible that they are hard to resist, and I think, worth it. They retail around $39.50 on the Noble Collection website, model #NN1910, but I bought mine at Barnes & Noble for $29.95. Check Amazon for best price as well as other likely websites and retailers.